Eddie Gulino ’16 grew up in Windham, a small, rural ski town in the Catskill region of New York. How small is Windham? About 1,700 people live there. Gulino attended the same school, from kindergarten to 12th grade, and had 39 people in his graduating class. That’s approximately a quarter of one percent of Syracuse University’s full-time undergraduate enrollment. Small-town living has taught Eddie the importance of personal interaction, mutual respect and strong civic involvement. Although he loved his bucolic upbringing, Eddie knew he wanted to go away to college, preferably to a mid-sized university. At Syracuse, he is a double major in economics and international relations, taking classes in the College of Arts and Sciences and the Maxwell School of Citizenship and Public Affairs. Although he graduates in May, Gulino already has a job lined up in Ernst and Young’s Business Advisor Program. He hopes to parlay his small-town roots and urban college experience into a lifetime of business and public service. Syracuse affords me a nationally recognized name with a mid-sized campus feel. It’s the dream campus. It’s allowed me to specialize, while giving me room to explore new academic paths. The people. The students I’ve met come from familiar backgrounds and worldly settings. They’re supportive, outgoing and extremely proud to be Orange. You instantly feel a connection with anyone from the University. Is there someone here who has influenced you? From my coffee-side chats with professors to everyone in Advising & Career Services [in A&S] who have helped me identify my post-graduate goals, I can truly say that I’ve benefited from the mentoring of many different people. 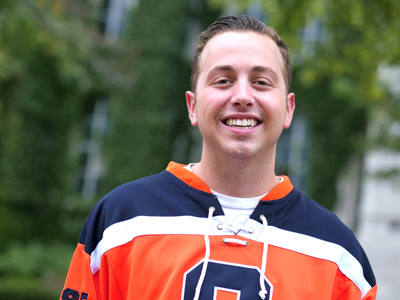 Syracuse helped me land a 10-week internship with JPMorgan Chase & Company. During my semester abroad in Madrid, I was able to use the Spanish I had learned [on campus] to study the structure of the European Union’s political and economic partnership. Sue Casson, director of Career Development and Services in A&S, encouraged me, and helped me realize that I had a lot of potential. I just needed to tweak a few things to hone my skills to the fullest. Also, I wouldn’t have come to Syracuse, if it weren’t for the annual Maxwell School of Citizenship Scholarship Competition. I placed first in it, and, as a result, was awarded a four-year academic scholarship. There’s nothing like hanging out on Marshall Street on game day. I grew up in a family that embraces the game-day culture, and there’s no lack of it at Syracuse. Getting a slice of pizza before a big game and then walking to the Carrier Dome with a group of friends is a great way to spend an afternoon. I belong to a community-outreach group that aims to economically unite the City of Syracuse with student consumers on campus. I’ve also belonged to Phi Kappa Psi since my sophomore year. I am completing my international relations capstone research project. This 25-page thesis analyzes a topic within my focus of global trade and international markets. I also like to go to cultural festivals and “eats” around town. Going downtown to the Irish or Italian festival, or having dinner at a local establishment is a lot of fun. The Panasci Lounge in the Schine Student Center. It has a real “lounge” feel to it, with a lot of electrical outlets and a ton of comfy couches. Did I mention there’s a gas fireplace and a Dunkin’ Donuts right below it? How is the University helping you achieve your goals? It’s exposing me to a diverse community, giving me opportunities, academically and socially, to interact with individuals who challenge my views. It also is shaping my perspective of things, through my involvement with the “Stocks & Finances” immersion trip to New York City and my semester in Madrid. Syracuse has changed my outlook on both the job market and the global community.